One of the quirks of economics is that, within GDP (gross domestic product), all output is included, irrespective of what it really adds to prosperity. GDP, like Oscar Wilde’s cynic, knows “the price of everything, but the value of nothing”. If government paid 100,000 people to dig holes, and another 100,000 to fill them in, the cost of this activity would be included in GDP. Is there a better way of measuring prosperity? Well, consider two people who both earn $30,000. Theoretically, their circumstances match. However, if the first has to spend $20,000 on household essentials, leaving him $10,000 to spend as he chooses – whilst the second spends only $5,000 on essentials, leaving him $25,000 for “discretionary” spending – then clearly the second is much more prosperous. This is analogous to what has been happening to the economy. The long-run trend towards higher energy costs is feeding through into essentials such as food, water, chemicals, minerals, plastics, construction and virtually every other essential purchase. This is undermining the scope for discretionary spending, leaving the economy poorer even if the headline statistics do not seem to bear this out. On the ground data bears this out. In the United Kingdom, for example, average wages increased by 25% between 2005 and 2015, but the cost of essentials rose by 48%. This process is happening around the world. GDP is higher in the second picture, but far more is spent on energy and essentials, leaving a smaller surplus available for everything else. This surplus – and not the recorded total of GDP – determines prosperity. Where this leaves the economy is with two pictures that do not match – raw growth numbers imply a prosperity that people seem not to experience. As a result, we – whether as individuals or as governments – have been using borrowing to supplement a diminished capability for discretionary expenditures. This in turn accounts for the escalation in debt. Between 2000 and 2007, world debt (1) escalated from $87 trillion to $142 trillion, triggering the global financial crisis. Slashing interest rates to all-but-zero has enabled us to co-exist with this debt, but the amount outstanding has continued to soar, now exceeding $200 trillion – whilst near-zero rates have been very far from cost-free. How does the cost of essentials, and the resulting impact on prosperity measured as capability for discretionary spending, help us to explain this? As most readers will know, the interpretation which guides all of my work is that the “real” economy of goods and services is an energy equation and not, as is so generally supposed, a monetary one. Everything that we buy or sell, produce or consume is a product of energy. Far back in history, this energy came entirely from human or animal labour. This changed fundamentally with the Industrial Revolution, when we began supplementing this labour with inputs such as coal, oil and gas. This process triggered a dramatic escalation in economic output which has totally transformed our society over more than two centuries. The modern economy is entirely a function of energy. As well as obvious uses such as transport fuels and plastics, energy is critical in access to minerals – without energy inputs, we could not possibly extract 1 tonne of copper from 500 tonnes of rock (and doing this using manual labour would make copper impossibly costly). That the earth now supports 7 billion people, compared with just 0.8 billion back in 1800, is entirely due to the use of energy in agriculture, both as indirect inputs as well as directly in planting, harvesting, transport, processing and distribution. Water, too, could be not accessed without energy inputs. If you doubt any of this, imagine how farming and the food chain would operate without energy inputs. Planting and harvesting would rely on large numbers of labourers and animals, all of whom would have to be fed. Inputs like phosphates would not be available without the energy needed to extract and transport them. Processing and transporting crops would be incredibly costly and difficult, as would storage without refrigeration. In short, without energy inputs, food supply as we know it today would collapse. Taking this a stage further, it is obvious that the cost of food must reflect the cost of energy at each stage of the process. 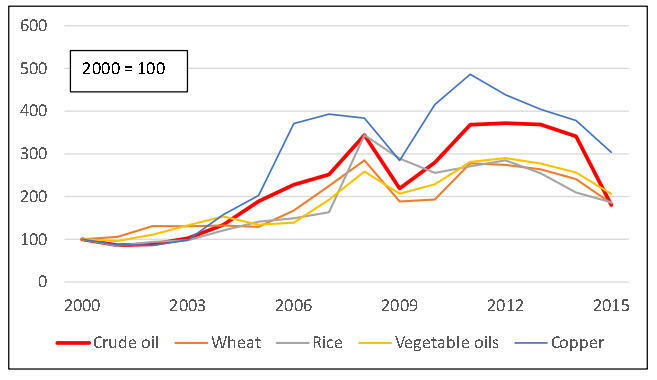 Correlation between energy costs (here represented by crude oil) and other essentials is illustrated in the next chart, which shows how the prices of wheat, rice, vegetable oils and copper have all tracked oil prices in recent years. This is far from surprising, since energy is the key input in the supply of these resources. They have tracked not just the increase in oil prices but also the post-2014 decline – but remain about twice as costly as they were in 2000, which compares with broad inflation of about 38%, globally, over the same period (2). Ultimately, the physical economy can be defined like this – it is a process of applying power inputs (rather than human labour) to raw materials which are themselves accessed using energy. Our homes, roads, schools, factories, railways, ships and hospitals could not possibly have been built by manual labour alone, or by relying on materials accessed without energy inputs. A key point will have occurred to you from the foregoing, which is this – an increase in GDP can correspond to a decrease in prosperity, if the proportion of GDP which has to be spent on energy (and energy-linked essentials) grows. We know that energy has a cost, which in fact is an opportunity cost – money spent on oil platforms, refineries, pipelines and solar panels is money that we cannot spend instead on hospitals and schools. The more expensive energy is, the less we have to spend on everything else. Energy is never free. The human capacity for physical work derives from energy gained from food, and obtaining food requires the use of energy. Likewise, accessing the energy contained in oil, gas, coal or renewables requires the expenditure of energy. Oil platforms, refineries, pipelines, wind turbines and solar panels cannot be built without spending energy. Extracting iron from ore requires energy, as does converting it into steel – and, on top of this, there is the energy expended in building the steel works itself in the first place. This applies to all components used in the energy access process. So the equation which determines prosperity is the relationship between, on the one hand, the amount of energy accessed and, on the other, the proportion of this energy consumed in the access process. This equation can be expressed in two ways. EROEI – the Energy Return On Energy Invested – expresses the gross amount as a multiple of the cost. My preferred measure is ECoE – the Energy Cost of Energy – which expresses the cost as a fraction of the gross amount of energy accessed. These equations change over time, through the interplay of two factors. The first of these, which pushes costs (ECoEs) up, is depletion. Naturally, we have exploited the lowest-cost energy sources first – just as you would always choose to develop a large oil field before a neighbouring small one, you would not extract costly oil from deep water fields, from shales or from bitumen if you could instead tap giant, simple reservoirs of high quality crude. As the most economical sources of energy deplete, we turn to successively costlier resources which push overall costs upwards. The second determinant, offsetting the depletion effect, is technology, where the advance of knowledge enables us to access energy more efficiently, and thus at lower cost, than in the past. The critical point about technology is that its limits are set by the physical characteristics of the resource. For example, the advance of technology has made shale oil far cheaper to produce than shale oil was ten years ago. What is has not done – and cannot do – is to transform shale resources into the equivalent of a giant conventional oil field like Al Ghawar in the sands of Saudi Arabia. Likewise, renewables are cheaper to produce now than the same renewables were ten or even five years ago. This has, in many instances, made renewables cost-competitive with oil, gas and coal. But this is a two-part process – the competitiveness of renewables has benefitted both from cost-lowering technology and from rises in the cost of fossil fuels. Renewables can compete with oil or gas developed today – but they could not compete with giant oil fields like Al Ghawar. Thus seen, the driver of costs is depletion (determining the physical envelope of energy access), with technology acting as a mitigating factor (improving efficiency within that envelope). It will be obvious from the above that we are studying comparatively gradual processes. Depletion is something that happens over time. Technology can advance more quickly than this, but the pace at which technology is applied is dictated both by capital investment and by the depreciation of earlier plant. Because the cost change process is gradual, it should be equally obvious that longer-term trends are critical. The immediate cost of energy to end-users can oscillate very rapidly through market forces, but these are oscillations around a longer term trend. Fig. 3 illustrates my analyses of where the ECoE costs of various energy sources now are. Obviously, these are broad-brush estimates, but should suffice for at least a general interpretation. The process of depletion has driven the ECoE of oil sharply higher. If we could go back to the 1950s and 1960s, we would see that oil production costs were extraordinarily low, which helps account for the very rapid annual consumption growth rates (as high as 8%) experienced at that time. But there has been a profound rise in oil costs in recent years. Coal costs, too, have been rising sharply, not least because the energy content per tonne has been falling markedly as the highest-quality resources are depleted. Gas costs, too, have been rising, though it remains markedly cheaper than oil or coal. The good news, of course, is that the ECoE of renewables has fallen sharply, making them cost-competitive with oil and coal, and no longer markedly more expensive than gas. The factors involved in reducing the ECoEs of renewables are technology and economies of scale. 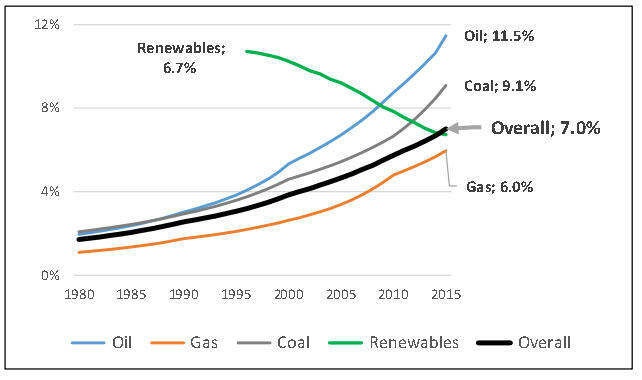 As little as ten years ago, renewables were a lot costlier to produce than oil, but this is no longer the case. A cautionary note is needed here, however. In 2015, renewables accounted for just 2.9% of primary energy consumption. As a still-small industry, renewables can be assumed to have cherry-picked the best sites first, just as oilmen developed the cheapest oil fields first. Rates of growth which are easily achieved from a low base become progressively harder to sustain as the base enlarges. Renewables can be expected to go on increasing their penetration of electricity supply very markedly, though the nature of solar and renewables suggests that some fossil- or nuclear-powered capacity will still be required. Other applications will be harder to crack, particularly where the sheer density of oil (measured as energy per unit of weight) remains critical. The gigantic petroleum-powered machines that hack minerals out of rock at concentrations of less than 0.5% might be hard to replace with electric alternatives, and an electric-powered aircraft of anything approaching the size of a 747 remains a pipe-dream. What we have, then, is a changing mix in which the overall ECoE is rising because of the uptrend in costs in the still-dominant fossil fuels sector. The next chart, comparing the annual cost of energy with the long-term trend, reflects this. The current cost of energy to end-users oscillates dramatically over comparatively short periods and, historically, oil has been the pivotal component. In the 1970s, OPEC drove oil prices sharply higher, where they stayed for a decade until weak demand, and a surge in non-OPEC supply, broke the cartel’s grip. From 2000, oil prices began to move up sharply, largely due to demand growth in China and other emerging market economies (EMEs). High prices invited massive investment in new supply, which has now pushed prices sharply downwards. This is an essentially cyclical process, and the slump in investment since 2014 suggests that supply shortages will in due course push prices back upwards. These price movements occur on timescales far shorter than the cost trends dictated by the interplay of depletion and technology. Depletion has for decades been driving the trend costs of fossil fuels upwards, in a way that can only be mitigated, not reversed, by technology. Technology is making renewables cheaper, but these account for just 2.9% of current global consumption. So the underlying trend cost of energy is rising relentlessly. Where, though, does this show up in our measurement of the economy? If energy costs more, we have less to spend on other things – but money spent on obtaining energy still forms part of GDP. After all, energy expenditures show up in activity measures, and money spent by an energy company provides business for suppliers and wages for those working in the energy and related industries. So the bottom line is that rising energy costs do not necessarily impair GDP, but do undermine prosperity, by reducing how much we have to spend on everything else. Rising energy costs will eventually impact GDP as we record it, because they will reduce our capacity for investing in other things. 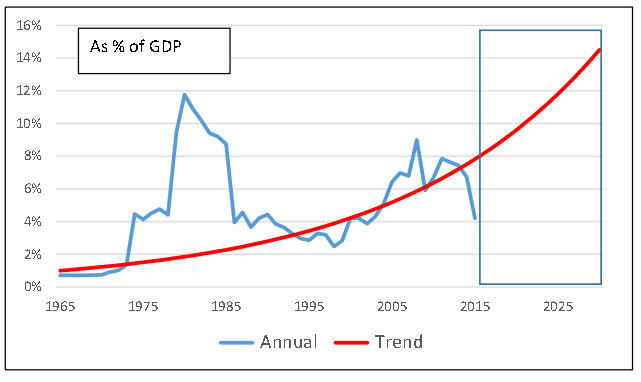 This makes GDP a trailing indicator of the economic impact of higher trend energy costs. If we want to anticipate this, and measure the current impact, there are two routes open to us. Both are based on the recognition that prosperity is a function, not of income in the absolute, but of discretionary spending capacity (the income that remains after the cost of essentials, really meaning the cost of energy, has been deducted). The first way of measuring the current impact of trend energy costs is a bottom-up measure of prosperity which factors in the cost of essentials at the individual level. The second, far more practical approach is to deduct the trend (not the current) cost of energy from reported GDP. Since the cost of all essentials – such as food, water, minerals, plastics and transport – is dictated by energy costs, deduction of the trend energy cost essentially identifies discretionary GDP. The global situation and outlook is set out in fig. 5. As trend ECoEs have risen, a widening gap has emerged between the financial and the real economies. This shows up within individual experience as an increase in the proportion of incomes absorbed by essentials. For the economy as a whole, the proportion of GDP that has to be spent on energy and its derivatives – including food, water and basic materials – has been rising, crowding out scope for discretionary expenditures even where total GDP is supposedly increasing. To picture what this means in practice, imagine a government health system whose share of GDP is constant, so that cash resources increase in line with GDP. This ought to make it possible for health provision to be enhanced – but the opposite happens, because the cost of essentials absorbs a growing proportion of its budget. In due course, this “crowding out” will impact investment in discretionary areas, meaning that headline GDP itself will start to fall. But prosperity – as it is experienced both individually and in the aggregate – will fall before the deterioration in the underlying situation is reflected in GDP. Finally – and whilst not wishing to intrude on private grief – fig. 6 shows what is happening to the real economy of the United Kingdom, and links it to trends in ECoE. From 1980 to about 2005, the UK enjoyed a lower ECoE than the global average, mainly because Britain was a major net exporter of oil and gas. But energy production has fallen sharply, from 249 mmtoe (million tonnes of oil-equivalent) in 2002 to 108 mmtoe last year, and the UK now has to import almost half of its energy requirements, despite a decrease in demand. This is a mathematical calculation delivered by SEEDS, and is reflected in a precipitate decline in real economic output. But what does this mean in practice – and can we see it in action? What it ought to mean, first, is that the comparative (through-cycle) cost of energy in the UK is rising – which it is because, since 2005, the cost of energy to British consumers has risen by far more (90%) than general inflation (27%). It ought to mean that the cost of essentials is absorbing a growing proportion of incomes – which, again, is the case, the cost of essentials having grown by far more (48%) than average wages (25%). It ought to mean that government budgets buy less services, even where those budgets have at least kept pace with inflation – as is palpably the case with health care. It ought to undermine ability to provide for the future, something which is reflected in huge pension fund deficits. That these trends are set to continue seems equally evident. Energy costs in Britain are rising, as reflected in the ultra-high contract price for electricity from the new Hinkley C nuclear plant. The cost of essentials will continue to rise (which the slump in the value of Sterling ensures). This will continue to make people feel poorer, as the cost of essentials continues to out-pace incomes. And it will further stretch public services (such as health), even where budgets rise at least in line with inflation. I rather doubt whether planners and policymakers, in Britain or elsewhere, understand this dynamic. If they don’t, they must be baffled by the phenomenon of more money buying less. The concluding point, generally applicable, is that the rising trend cost of energy – and hence of energy-derivatives such as food and minerals – is squeezing discretionary spending capability even before it exerts major downwards pressure on gross output. The latter is beginning to happen as well, though, through a squeeze on discretionary investment capacity. What this all means is that we should take headline GDP figures with the proverbial pinch of salt. What really matters is prosperity, meaning scope for discretionary spending after the cost of essentials (really meaning energy) has been deducted from incomes. By this critical measure, we are at the end of growth – and no amount of borrowing, or of mortgaging the future, can change this, or even long disguise it. Includes financial sector. Debt excluding the financial sector was $67 trillion in 2000 and $105 trillion in 2007, and is about $155 trillion now. The Second World War was a time of enormous hardship for the British public. But there were some people for whom it was manna from heaven, and I’m not talking about black-marketeers. Poor service in a restaurant? “Don’t you know there’s a war on?” Shoddy workmanship? “Don’t you know there’s a…….” There seemed to be hardly anything that couldn’t be blamed on the war. “Brexit” – the ugly label for the voters’ decision to leave the European Union (EU) – is being used similarly, as a stock excuse for any and all weaknesses in the British economy. Behind the Brexit bluster, what is really happening in Britain is the culminating failure of a faulty economic model. The theory of “neoliberal” economics has been openness to foreign investment even in strategic areas, the adoption of mantras of deregulation and privatisation, and a willingness to surrender decision-making to the market. The practical outcome has been sluggish growth, an escalation in debt, widening inequality and a dangerous dependency on foreign creditors. If Brexit tells us anything, it is that critical scrutiny of the British economy has revealed some dangerous weaknesses. When British voters defied the establishment by voting to leave the EU, then they were doing more than simply rejecting supposed European incursions on their sovereignty – they were rejecting an economic system whose failures have been manifested in the British economy. Though regrettable, the use of Brexit as a catch-all excuse is understandable. Brexit, after all, is the first decision in decades to be taken directly by the public, rather than on their behalf by politicians. No-one grounded in reality would expect politicians to miss such a golden opportunity for wholesale blame-shifting. This being so, we should be wary about “the Brexit excuse”. We should remember that America, Japan, China and others trade perfectly satisfactorily with the EU without being members of it. We should also note that many of Britain’s glaring economic weaknesses long pre-date the EU referendum. Of course, there has been at least one direct result of Brexit – a sharp fall in the value of Sterling. Even here, though, politics has influenced markets. Overwhelmingly, government, big business, finance and the mainstream media urged a “remain” vote, so the voters’ “leave” decision was a ringing rejection of an arrogant establishment. It also, of course, created immediate uncertainty, with the departure of premier David Cameron and chancellor George Osborne. Consequently, markets have had to recalibrate political risk, recognising that the British are not, after all, grumbling-but-resigned followers of their leaders’ diktats. Despite an electoral system (known as “first past the post” or FPTP) designed to entrench the incumbency, the public proved themselves far from supine when given a first-in-a-generation directly proportional consultation. From a global standpoint, you might think that Britain doesn’t matter all that much in the grand scheme of things. But we do need to note two significant points. First, Britain remains important enough – particularly in finance – for her travails to influence global developments. Second, the UK, even more than the United States, has been the poster-child for neoliberal economics – not for nothing is this called “the Anglo American model” – so Brexit may accelerate the demise of an increasingly discredited orthodoxy. For three decades and more, the UK has championed an extreme variant of “laissez faire”. Britain has welcomed overseas investment even where that has meant strategic industries, protected in most other countries, falling into foreign hands. The UK has supported the deregulation of finance, championing the now-derided “light touch” regulatory system which helped lay the foundations for the 2008 banking crisis. Privatisation, though it began with industry, has now penetrated deep into public services, and few restraints have been exercised over immigration. To a significant extent, British failure constitutes the failure of an economic philosophy as well. The critical metric for the British economy is the current account, where the deficit has widened alarmingly – to 5.2% of GDP last year, from 1.2% in 2005. It hit 7% in the final quarter of 2015. Within this, the trade shortfall has been a relatively stable component, being somewhat better in 2015 (at 2.0% of GDP) than in 2005 (2.7%). The slump in the current account has instead reflected a collapse in the net flow of income. Back in 2005, this flow was positive, contributing £20bn (1.5% of GDP) to the current account, and usefully offsetting the trade gap. In 2015, however, income was in deficit to the tune of £60bn (3.2% of GDP), a sharp and dangerous reversal in a comparatively short time. The disturbing connection here is that current account shortfalls have become a vicious circle. Each deficit, when met by asset sales or borrowing from overseas, sets up increased future outflows in the form of profits and interest. 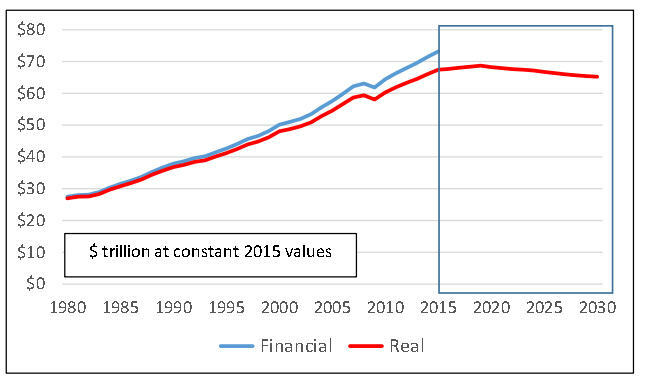 To this extent, Britain has been trashing her balance sheet to sustain consumption in excess of current output. British GDP and, with it, British viability, has become increasingly dependent on what central bank chief Mark Carney has dubbed “the kindness of strangers”. This is a misnomer, of course, because lending and investment are determined by calculation, not altruism – and here lies the immediate problem. The slump in Sterling means that those who lent to or invested in Britain last year are now sitting on losses of about 20%. If they decide that putting further capital into Britain would amount to “throwing good money after bad”, the UK will be in very, very deep trouble. The harsh reality is that about 6% of British GDP, or £120bn, comes courtesy of foreign creditors. If selling assets and taking on debt to subsidise consumption looks feckless (which it is), further evidence to the same effect can be found in Britain’s aggregates of debt and quasi-debt. 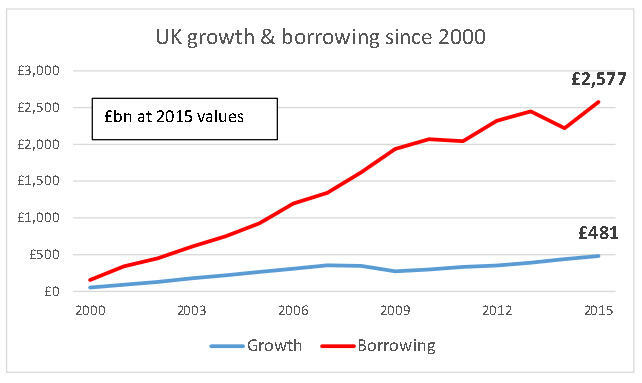 Between 2000 and 2007 – but expressed at constant 2015 values – growth of £354bn in GDP came at a debt cost of £1.34 trillion, or £3.80 of borrowing for each £1 of growth. Since then, the ratio has worsened dramatically, with £127bn in net growth requiring £1.24 trillion of new debt, a borrowing-to-growth ratio of £9.70 per £1 (see chart). Even these numbers exclude borrowing in the “financial” or inter-bank sector. Of course, this very strongly suggests that “growth” has really amounted to nothing more than the very inefficient spending of borrowed money. This addiction to borrowing has ravaged the British balance sheet. Whilst a 268% ratio of debt to GDP (1) may not look too serious, inclusion of the banking sector (2) increases this to around 450%. On top of this, the most recent, knee-jerk cut in policy rates worsened the deficit in private pension provision to £945bn (52% of GDP) (3), whilst unfunded public sector pension commitments are generally put at £1,000bn (55%). This has three disturbing implications for the British economy. First, it is becoming ever clearer that past irresponsibility has undermined Britain’s future financial security. Second, it has turned Britain increasingly into a supplicant for the goodwill of China and others. Third, the UK is in no condition to cope with increases in interest rates, yet such rises may become inevitable if international markets continue to take a tougher stance on British risk. Some believe that the slump in Sterling might itself start to improve things, making imports more expensive whilst boosting the competitiveness of British exports. One obvious snag with this is that a weaker currency increases the cost of essential imports, which include food, raw materials, components, the consumer iFads to which many in Britain seem addicted and, thanks to serious policy failures, rapidly increasing quantities of energy. A second is that it is by no means clear what Britain has to export – or that exporters will use a cheaper pound to boost volumes, rather than simply pocketing fatter margins. Above all, of course, the British external problem does not lie in her trade deficit so much as in a rapidly-worsening income balance – and this will continue to worsen, until and unless the UK ceases relying on foreign creditors to subsidise consumption. Two things are clear. The first is that, as exemplified by Britain, neoliberalism has failed, widening inequalities whilst sacrificing the balance sheet on the altar of immediate self-gratification. The second is that Britain must reform to survive, specifically by shifting incentives from speculation to innovation. In short, innovation has weakened – and productivity with it – because riding state-backed inflated asset markets has been made into a surer and less risky route to prosperity than developing new products and services. Here, some of the early statements of new PM Theresa May are encouraging, but the really tough calls – such as increasing capital gains taxation, and extending it to all property gains, in order to reduce the tax burdens on small and medium enterprises (SMEs) – still lie in the future. She may be helped in this, ironically enough, by the very same “baby boomer” generation which hitherto has ridden the wave of asset inflation and demographic unfairness. Boomers, sitting complacently on inflated property values, might soon begin to wonder to whom they are going to sell their property when they need to turn it into cash. Well, they won’t be selling to a younger generation that they have helped to impoverish. That they might have to monetise it at all has been made much more likely, and more imminent, by the undermining of pension investment. Historically, the impetus for reform has seldom come from smugly comfortable beneficiaries of the system. This time, though, might just be different. For reasons largely outside my control, there’s been a bit of a hiatus here in recent weeks. This said, I’m working on a paper that I think could be very interesting indeed, examining how we measure prosperity, something which reported GDP data conspicuously (and increasingly) fails to do. That paper is work in progress. Meanwhile, what is the state of play? As it happens, not a lot has changed during my absence. Fundamentally, the world financial system continues to look bizarre, with ultra-low rates destroying both returns on capital and pension provision whilst failing conspicuously to deliver the much-vaunted “stimulus”. So abnormal have things become that I’m waiting on “the great reset”, and the turbulence that will necessarily accompany it. An essentially stagnant global economy simply cannot go on accumulating ever more debt without the system toppling over. Finance – waking up to reality? There does seem to be a dawning comprehension, amongst supra-national organisations at least, that a point may rapidly be approaching when we can no longer live on an endless tide of cheap credit. Though there remains much talk of growth, “secular stagnation” is probably the best gloss we can put on the underlying economy. Western central bankers, I suspect, may waking be up to the fact that, if you wanted to go somewhere progressive, you wouldn’t start from here. I’m pretty certain that, had they access to a time-machine, central bankers would go back and make some significant changes. Slashing interest rates in 2008 and 2009 did make sense, as did using QE to – as I see it – depress yields by driving bond markets upwards. But these were emergency measures, and should have been temporary. The central bankers’ big mistake, influenced no doubt by Wall Street, was to allow ZIRP to become permanent. With hindsight, they should have started to push rates back upwards pretty soon, starting no later than 2010. A policy of normalisation, had it been pursued, might have driven GDP lower, but an immediate, one-off hit could have been a lot better than allowing denial to push us into a tunnel of the surreal. A policy of interest rate normalisation would, no doubt, have triggered some big losses – but this, too, would have been manageable, and a “back to normal” approach would have staved off an escalation in debt which is now looking very dangerous indeed. Thanks to the prolonging of ultra-loose monetary policy, debt has escalated. Back in 2008, debt of $140 trillion was enough to frighten the system. Now, debt has soared beyond $200 trillion, where I suspect that fear has been replaced by outright paralysis. Politicians and most commentators, meanwhile, remain way off the pace, not just of economic fundamentals, but of public feeling as well. The same experts who told us that Donald Trump was a “joke candidate” with no chance of winning the Republican nomination, and that the “out” campaigners couldn’t possibly win Britain’s “Brexit” referendum on EU membership, continue to misunderstand how rapidly the political landscape is changing. These experts now think that revelations about Mr Trump’s deplorable attitudes to women will kill off his campaign, and that Jeremy Corbyn’s only chance of winning power in Britain is to shift to the centre-ground. They are wrong on both counts, and wrong, too, if they underestimate the pivotal, pan-EU importance of the Italian referendum on constitutional reform set for 4th December. What, then, is the reality that politicians, pollsters and pundits are missing? In a word, that reality is anger. In America, surveys show a rapidly rising tide of consumer discontent which increasingly merits the label “rage”. This is directed against utilities, cell-phone providers, airlines and other sectors in which the market dominance of a handful of players enables them to ignore consumer anger. Rather than helping customers – who in reality have nowhere else to go – these corporates concentrate instead on influencing Washington, to ensure the maintenance of barriers to entry. Voters and consumers are the same people, and consumer anger against corporate arrogance feeds into a mood of rebellion against the establishment. This, for many, makes Mr Trump, whatever his faults, an attractive proposition. It also makes voting for the quintessentially-establishment Hillary Clinton almost unthinkable. Likewise, the anti-establishment anger which delivered “Brexit” also informs strong support for Labour’s Jeremy Corbyn. What pollsters and pundits seem unable to grasp is that this support does not come from the comfortable, those people who are satisfied with “politics as usual”, and whose voting intentions can be measured. It comes instead from the ranks of the insecure, generally younger and often non-voting millions who are the victims of depressed incomes, employment insecurity (the “gig economy”), the high cost of housing and, above all, the sense that nothing is ever going to get any better for them unless society changes drastically. Because these people do not respond to telephone surveys, and have better things to do with their time than take part in focus groups, they tend to fall beneath the pollsters’ radar. But they are numerous enough, and motivated enough, to swing an election – provided that Mr Corbyn does not try to become another centrist in the Blair mould. At the moment, the Western governing establishment relies on the votes of the so-called “baby boomer” generation, people who seem to be sitting pretty on hugely inflated property values. This, though, is likely to change when the boomers – or the market on their behalf – starts to ask two very awkward questions. First, what’s happened to your pension? (answer: thanks to ZIRP, its value has cratered). Second, to whom do you think you’re going to sell your highly valued property, when you need to monetise it? (hint: not to a younger generation that has been deeply impoverished by demographic imbalances). The irony here is that Theresa May is shaping up to be the first British leader in a very long time who really understands the issues of isolation and sheer unfairness which are bubbling beneath the surface of formal politics. It is her misfortune that her premiership seems to have coincided – if the exchange rate is any guide – with the fundamental flaws in the British economy being rumbled. Those who blame the slump in sterling (along with pretty much everything else) on “Brexit” seem to have overlooked Britain’s horrendous current account deficit, which long pre-dates the EU referendum. Anyone who believes that “Brexit” is alone responsible for the slump in GBP has to believe something else, which strains credulity to the limit – which is that, in or out of the EU, Britain could have gone on living beyond its means to an extent sustainable only on the basis of foreign capital injections of £100bn annually, and rising. Those who lent to or invested in the UK during 2015 are sitting on losses averaging about 20%. They must now be running their slide-rules over the British economy, and not liking what they see. If they decide that advancing further capital would amount to throwing good money after bad, the game really is up. Events in Britain and America – even without bringing the Eurozone, China and Japan into the equation – make the economic and political outlook fascinating, albeit rather frightening. What we are witnessing in the West is the start of regime-change, with the neoliberal orthodoxy, which has ruled the roost for three decades and more, destined for the shredder. The global economy has become unsustainably addicted to borrowing, and has created a mountain of debt that would imperil even a strong economy, let alone one that is flat-lining. But where and how are we going to see the economic implications of this mess feed through into data? Well, SEEDS – the Surplus Energy Economics Data System – can supply some answers, by distinguishing between the “financial” and the “real” economies. The current SEEDS projection is that the global “real” economy, expressed at constant 2015 values, will grow very gradually, from $67 trillion last year to $69 trillion in 2019, before commencing a decline that will reduce it to $66 trillion in 2025 and $64 trillion by 2030. This does not amount to a crash, but it does mean that growth is over. This looks rather worse when you take some other issues into account. First, the global population continues to increase, so growth at the per-capita level is poised to reverse significantly. This seems certain to feed into the politics of insurgency, because inequalities of wealth and income become very much harder to defend when per-capita average prosperity is shrinking. Second, “excess claims” – that is, claims created by the financial economy that cannot be met by the real one – have already climbed to $80 trillion, from $55 trillion as recently as 2010, and look set to top $100 trillion by 2019. If you’re familiar with surplus energy economics, you’ll know exactly why all of this is happening. However, GDP, as we measure it, is unlikely to capture the plateauing of real economic output, whilst the accumulation of “excess claims” – effectively, the proportion of global debt that is incapable of repayment – cannot be measured using conventional methodologies. For those of us familiar with surplus energy economics, this isn’t entirely disadvantageous, as it should give us an edge in terms of anticipation. What we do need, however, is a way of reconciling the SEE-based measurement of the real economy with data in common usage – and this is my current work-in-progress.